BP: I guess that was the very nascent stages of the Prashanti Vidwan Maha Sabha. Then Bhagawan was conducting it all by Himself! SS: Yes. It was like a discourse which He would give in the later years but at that time it was more of a conversation. In the evening they used to have palanquins. Florists used to come, especially from Bangalore and make these palanquins with exquisite themes for each of the nine days. 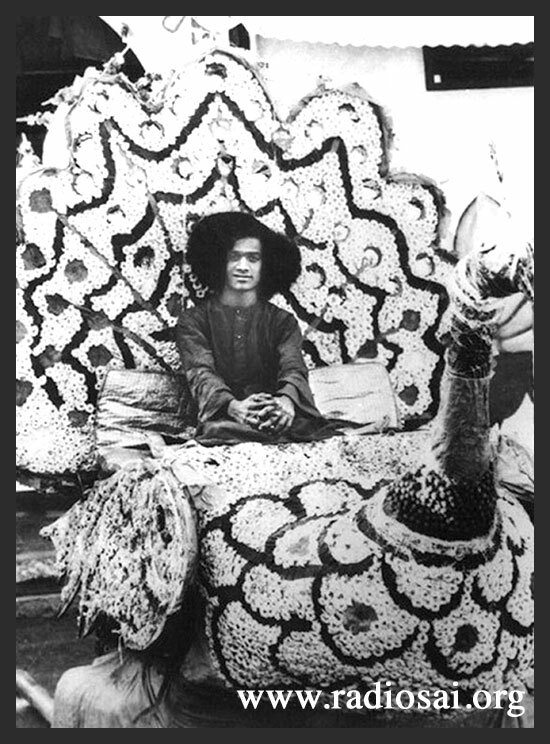 It's interesting to note that Swami used to wear dresses based on the theme of the palanquin. The colour combination of His robe and His dhoti would be matching the theme. Swami used to go inside at about 6 in the evening, and finally the doors would open at 8 p.m. and Swami would come out. It was as if He was taking instant feedback from the devotees about His choice of the colour. Then He used to sit on the palanquin. Every day there would be a different theme: a swan on one day, a peacock on another day, a Garuda on the third day, a lotus on the fourth day, and so on. Each of Swami's dresses used to match the theme. 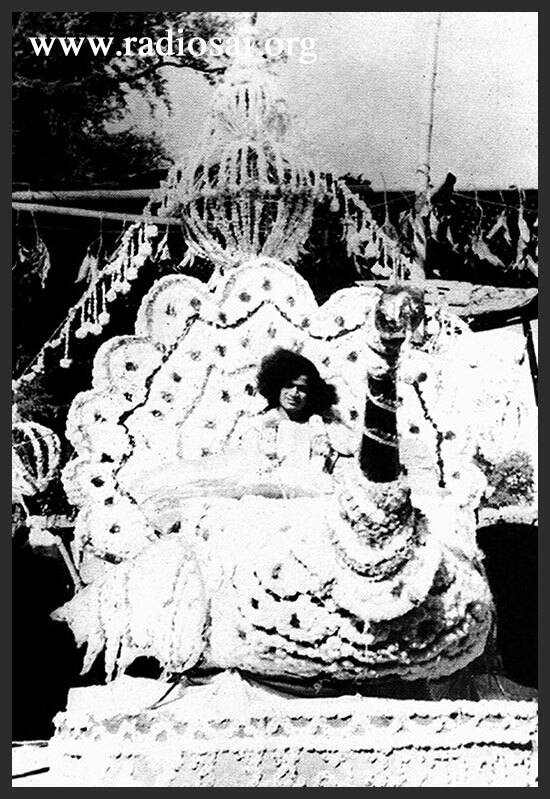 For example, when they had the peacock palanquin, Swami's dress was more like Lord Subrahmanya. When it was Garuda He used to wear the white robe like Lord Vishnu. The dhoti would also match the robe. If it was a white robe it would be red dhoti, a contrast to the robe. If it was a lotus then it would be a parrot green dhoti to match it. And sometimes even a purple robe. BP: Swami ensured that He did everything that would delight the devotees. SS: Yes. It's unimaginable now even to visualise Swami in those colours. BP: For the joy of devotees He has gone to any extent. SK: In fact in the 1940s you can imagine a much younger Swami. BP: Yes, the partition of His hair was still seen. SS: Yes. He used to have a middle parting on His hair and it used to be one huge crescent on one side and a little lesser crescent on the other. VN: Sorry to interrupt but I believe there was something like a Sumangali Puja. Do you remember anything, Shashank? SS: I think that was done in the morning. Is it the same, sir? VN: Yes. Swami used to send elderly ladies to the houses with vermillion, mirror, bangles and so on in a plate and He used to first invite them to come for the puja. When we were cleaning upstairs we even saw a trunk full of bangles. Swami used to say, “In the good old days I used to send all these things and invite the Sumangalis (married women).” All those items were still lying in Swami's room. SS: If I can continue, in the evening the procession used to start at about 8 o' clock and Swami would ascend into the palanquin. They would take the procession through the Puttaparthi village. It used to take 4 or 5 hours because they would go slowly in front of each of the houses. They would stop the procession in front of specific houses like Easwaramma garu's, Venkamma garu's, Parvathamma garu's and Karanam Subbamma's. They used to come out and do arati to Swami. Obviously they had the so-called ‘right’ because Swami was their 'brother' or 'son' or 'foster son'. So it was their privilege to offer arati to Him. By the time they returned it would be around 2 o'clock in the night. Even then they wouldn't let Swami get down. They would take the palanquin which was on their shoulders and start swaying it's like it's a cradle. BP: At 2 o'clock in the night? SS: Yes, as if putting Swami to sleep. They used to sing lullabies when they were swaying Swami in the palanquin like a cradle for almost half an hour or more. Slowly they would wind up and then let Swami retire. SK: In villages overnight programmes were not really uncommon in those days. BP: Bhagavat Kathas (folk plays based on scriptures) used to go on overnight. SS: Yes. In fact, many miracles happened during these processions. When Swami was on the palanquin they used to see Vibhuti getting materialised on His forehead in three distinct lines. The Vibhuti would constantly keep falling and then it would slowly get crystallised into three golden lines on His forehead in the horizontal direction. That was one miracle seen very often by them. The writers mention that even though the procession should be forward-looking they used to actually keep looking back at Swami who was sitting on the palanquin. They would bang with each other because they didn't want to miss any glimpse! It seems one day Swami was dressed up as Devi (mother goddess) for the procession. When they looked at Swami from the left half of His face they could see Him as the Mother Goddess Herself. They saw a red zari brocade saree, an orange or green matching blouse, all the flowers on the hair and the heavy jewellery adorning Her very distinctly. And when they saw Swami from the right side they could see Him as Shiva with the Ganges, the crescent moon on His matted locks and the snake as an ornament on His throat. They also saw the Vibhuti marks on His shoulder and the dear skin as His dress. So they saw in one single occasion both Shiva and Shakti together. 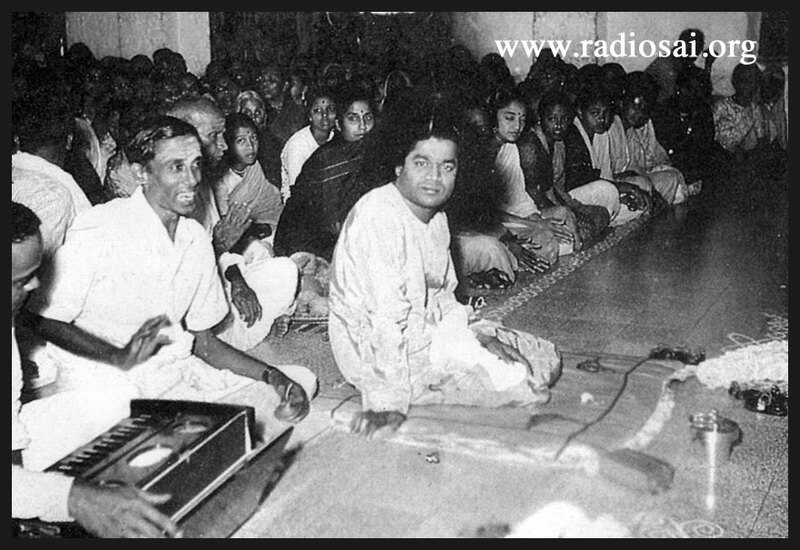 When they were aghast on seeing Swami like that, He used to blink His eyes and smile at them as if He was playing a little mischief with them in terms of showing them the Cosmic Form and yet being one among them as their kinsman. So those were really glorious days. If we were not devotees we would definitely think that it's a scene from some puranic story because it seems impossible to happen. But having been with Swami we know nothing is impossible. SK: In fact I am reminded of a miracle regarding Swami throwing flowers on devotees. They used to not fall as flowers but as toffees or coins. My father used to have one such coin, on one side there is image of Balaji Venkateshwara and on the other side is Shirdi Sai Baba. SS: I recollect that once in Africa a similar thing happened. 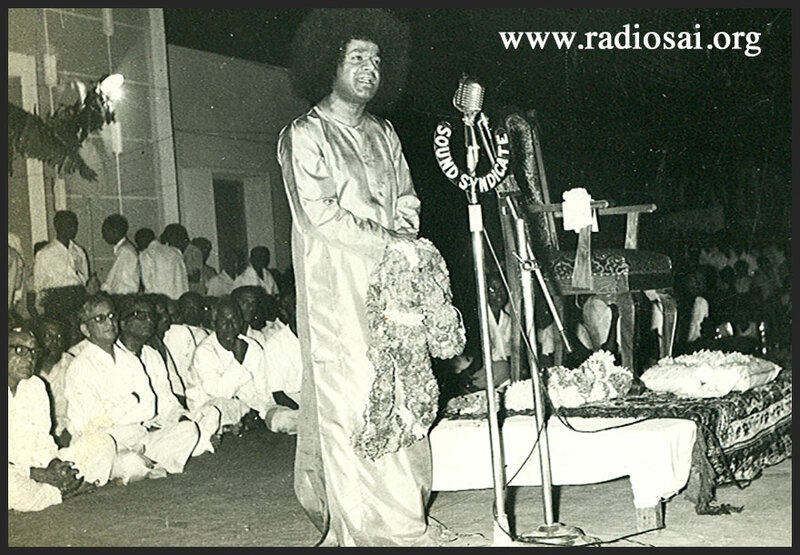 When Swami was leaving, the devotees wanted some gift and in the prasadam that was distributed each of them found a pendant and every single pendant had a different insignia. The Christians found a cross, the Muslims found ‘Allah’ written and Hindus found their own Ishta Deva or their favourite deity. So I think it's a very common miracle of Swami across continents. SK: I have read this particular incident in one book. As a part of the puja in the morning, ladies used to do the Kumkum Archana and this used to happen for the entire Navaratri celebration. At the end Swami used to distribute blouse pieces to each one of them. Each lady would think mentally what colour she should get and one day it so happened that as Swami kept distributing to everybody, every lady got the colour she actually wanted, even though it appeared that He was distributing randomly. So Swami always ensured that everybody got exactly what they wanted. BP: Wonderful! So many amazing things the Dasara celebration has been a witness to. I think there are a lot of details that many of us perhaps could not even see and there is a lot that is not documented. But whatever is documented is itself so fabulous. So this is something that happened in the '40s and '50s. Let’s now move on to the '60s. I think that is the time when the Yagnam in the formal way as it is now being done was started. Is that right, Veda Narayanan Sir? VN: Yes. Swami started connecting this Vidwan Maha Sabha and the Dasara formal celebration. I think it was mainly formed from '61-'62 onwards. Whenever Swami used to visit Venkatagiri, the Raja of Venkatagiri used to invite a lot of scholars. They used to have such congregations regularly and each scholar would speak on various spiritual topics. Maybe Swami felt a similar congregation should be conducted in Prashanti Nilayam too. So in '61-'62 the Veda Purusha Saptaha Gnana Yagnam for the first time was organised in Prashanti Nilayam. I came to Swami in 1968 and I remember there was hardly anything here. There was no east Prashanti then. If you sat in front of the Mandir you could directly see River Chitravati because there was nothing in between. It was only thorny bushes here and there, nothing else. There were hardly any shops. In a corner there used to be a tea shop, that's all. So Swami specifically told Bairagi Sastry, “Make a detailed list and I will get everything.” The scholar made the list and gave it to Swami and everything was brought. SK: In fact Swami said that it was with the Raja of Chincholi. VN: Yes, Swami said, “I had to get it from there in order to give it to you.” That's the Lord's omniscience and omnipotence. BP: He is the Yagna Purusha, the One to whom all the worship finally goes but He's the one who is also organising every single bit of the celebration. SK: Just to add a bit of info, that particular vessel, if I am right, is used specifically in one particular place. The water in that vessel is sprinkled all across the yagna kundam chanting these mantras Ateethe, anumanya-swa, anumate anumanya-swa, Saraswate anumanya-swa, deva savitaha prasuva, it means we are actually taking the permission from the Yagna Purusha to commence the yagnam. This particular vessel is used specifically to sprinkle the water in a very efficient manner. In fact this morning they were doing this particular rite and at that moment I remembered this incident.